A really nice cpu. Fast and seems to be reliable enough. I bought this in 2013 and am just now writing a review. Maybe I will OC it someday but as for now it works fine for a normal every day cpu. Was also hoping to game with it but that really never worked out. 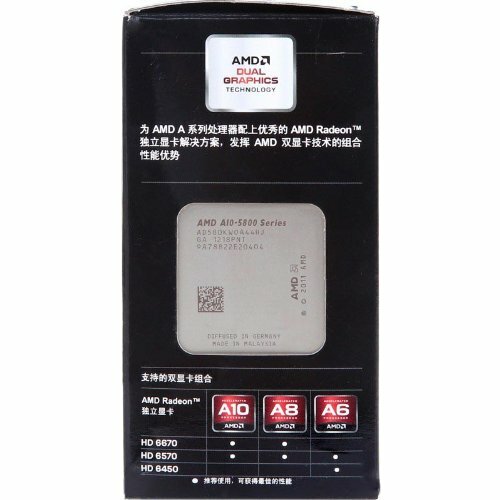 Overall, for an AMD cpu it's really nice. It runs quite hot and Probably should be liquid cooled rather than air cooled, but the be quiet! Pure Rock fan has proven more than up to the task. If it ran a bit cooler and used a little less power, I'd rate it one star higher. great APU for a budget build and runs games like minecraft on stock. great for an all round office build. only con is it can get hot if you plan to overclock it. Seems to work okay, although i'm sure it is bottle-necking the system it was free and worth it.